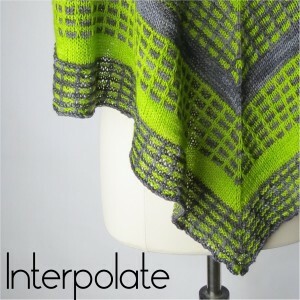 I am thrilled to release Interpolate, the first shawl in my newest eBook, On the Grid. The eBook will eventually contain 3 shawl patterns, all using multiple colors and slipped stitches for a very contemporary look. The knitting is very relaxing and TV friendly. Great for travel knitting. Through Sunday, July 6th, the pattern is on sale for $4 and the eBook is $10 (no coupon required). Stunning String has an Interpolate Yarn Kit available. It will be $39.99 ($10 off) through July 3rd (no coupon required).